The objective of this study was to assess resource allocation of antenatal and natal health services and its effect on utilization of these services among the urban and rural strata in Zagazig District, Sharkia Governorate. More than half of the Egyptian population (57%) living in rural areas according to Egypt Health Profile (2011), especially poor rural areas, have access to fewer healthcare resources. Improving resource allocation of healthcare greatly influences the utilization of health services. A cross-sectional study was conducted on 400 married women during the child bearing period. Stage 1: four primary healthcare facilities (units and centers) were chosen by simple random technique. Stage 2: from each health facility, the sample size was estimated according to the total number of registered women in each site through proportional allocation method. Women who attended to these health facilities for antenatal care or regular check-up visits (child vaccination, outpatient) were interviewed by a predesigned questionnaire. Utilization rates were estimated and compared regarding residence. Resources were assessed by the resource allocation checklist which was adapted from the Egyptian Ministry of Health. Checklist explains the minimal required resources needed to provide the service according to the Egyptian Ministry of Health instructions. The study revealed high utilization rate of antenatal and natal health services in urban facility than in the rural one, with availability of most of health resources needed for providing the services in urban units with their limitation and even unavailability in rural units. Resources allocation affects greatly health services utilization. Health resources are more available in urban residences over rural ones. So urban residences are more likely to use health services more than rural one. Central to the thinking about healthcare delivery is the idea that healthcare resources should be allocated purely according to the need, excluding all other factors such as, for instance, income or residence which means distributive justice . Healthcare resources must be distributed to regions according to the population size, healthcare needs, and (if income affects access) the income mixes within each regional population, rather than any historical pattern of distribution toward relatively wealthy regions . Moreover, incentives/directives are needed for sufficient facilities and staff to locate and remain in underserved areas. Recent studies have illustrated that attendance at antenatal clinics and receipt of professional perinatal care are associated with a reduction in maternal deaths. Antenatal care reduces maternal and perinatal morbidity and mortality directly through early detection and treatment of pregnancy-related illnesses, and indirectly through the identification of women who are at increased risk of complications during child birth . Besides, counseling couples during premarital stage about the importance of antenatal care plays an important role on future mother compliance to this provided care . According to Elzanaty , maternal mortality ratio declined from 62/100 000 in 2008 to 45/100 000 in 2014. The improvement in maternal mortality can be attributed to overall development, promotion of education, poverty reduction, stronger government health policies, improved medical technology, and access to primary care. Utilization can either be measured through microlevel surveys, which ask if individuals have used inpatient, outpatient, or day services in the past 6 months or year or through accounting data of expenditure or claims data. Service availability traditionally uses indicators on the per capita availability of medical staff and resources such as hospital beds and medical technology units. Other indicators of service availability such as distance, travel time, travel cost, or available public transport to the nearest medical resources . The study was conducted to assess resource allocation of antenatal and natal health services and its effect on utilization of these services between the urban and rural strata in Zagazig District, Sharkia Governorate. A cross-sectional study was conducted among randomly selected four primary health facilities at Zagazig District, Sharkia Governorate, Egypt. The study was approved by the Ethical Committee of the Faculty of Medicine, Menoufia University. Informed consent was obtained from women (customers of the services) after simple clarification of the study objectives and methodology. Sample size was calculated using Epi-Info (Atlanta, Georgia, USA) at 95% confidence interval and 5% SE, with 30% frequency rate, which was the percent of women having any antenatal care according to Egyptian DHS 2008 (this is the lowest frequency recorded regarding maternal health indicators). The total number of married women in the child bearing period in Zagazig District was determined as 181 535 women according to the last census recorded in the Zagazig District Health Directorate. So the sample was estimated to be 400 married women in the child bearing period whether pregnant or not (nonpregnant women were asked about their previous pregnancies, antenatal, and natal care) with the exclusion of unmarried females. Four primary health facilities were selected randomly from the urban and rural areas in Zagazig District. From each health facility, the sample size was estimated according to the total number of registered women in each site by the proportional allocation method. All participants were interviewed using a predesigned validated maternal health services utilization questionnaire. The questionnaire was accepted to be used then it was translated into the Arabic language. The questionnaires were administered to women of selected health units and centers, with items being read out verbally to women by the researcher. Questions were explained by easy language to be understood from the participants. The questionnaire included the following: personal data for assessment of sociodemographic characteristics, questions assessing antenatal–natal services utilization. Resource allocation checklist was delivered from Zagazig Health Directorate, Ministry of Health and Population, head of central administration, integrated healthcare, MCH department . The checklist was adapted according to the objectives of the study to assess the resources needed for conduction of antenatal and natal health services available in the primary healthcare facilities. Every selected health facility was evaluated using this checklist. It contains questions regarding facility capabilities and resource allocation as a measure of equitable distribution of resources in urban and rural healthcare in Zagazig District according to the Ministry of Health. Checklist is accessible through the health directorate of Zagazig District – Primary Healthcare Sector. The checklist was used by the researcher with help of a health worker to assess the resources available and needed to provide these services in each unit. Qualitative data were expressed in number and percentage and analyzed by using c2-test and Fisher's exact test would be used to detect the relation between different qualitative variables. Quantitative data were expressed as mean ± SD and analyzed by using t-test and Fisher's exact test. Data delivered from the resource allocation checklist was summarized by graphical methods using bar charts. The checklist is represented graphically by bar charts. 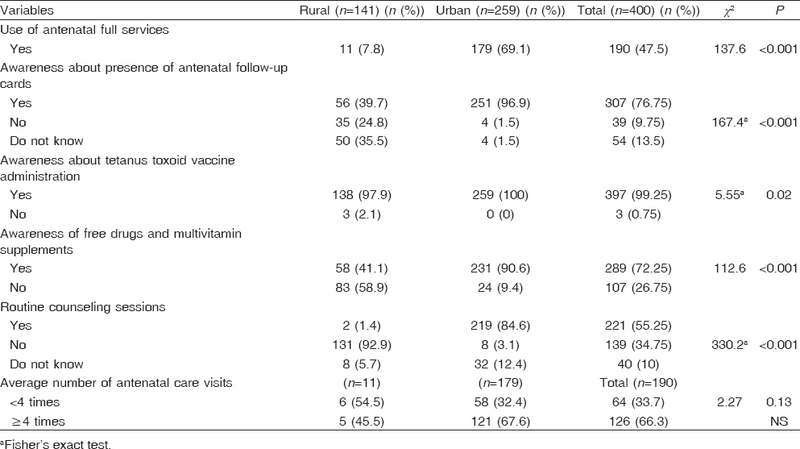 The study showed high utilization rate with statistical significance of most of antenatal services provided by health facility in urban residences than the rural ones [Table 1]. It also showed availability and high utilization with statistical significance of natal (delivery) services in urban areas than in rural ones [Table 2]. The checklist is represented graphically by bar charts. The study showed complete absence of natal services in rural units with its availability in urban ones [Figure 1] and [Table 2]. Figure 1: Availability of antenatal/natal health services. 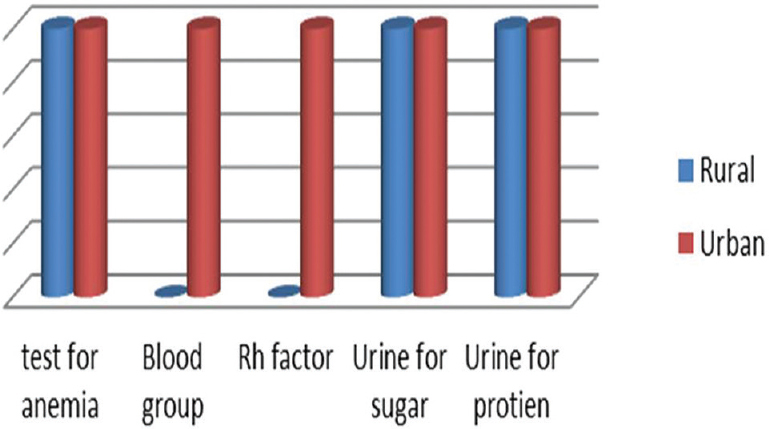 Regarding resource allocation in rural and urban health facilities there were defects in blood group and Rh factor typing in rural facilities as in the routine laboratory tests provided by primary health facilities during antenatal care [Figure 2]. 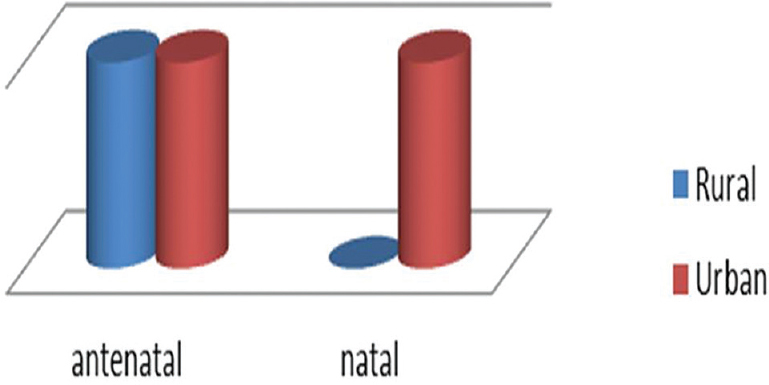 Figure 2: Routine laboratory tests provided during antenatal care. 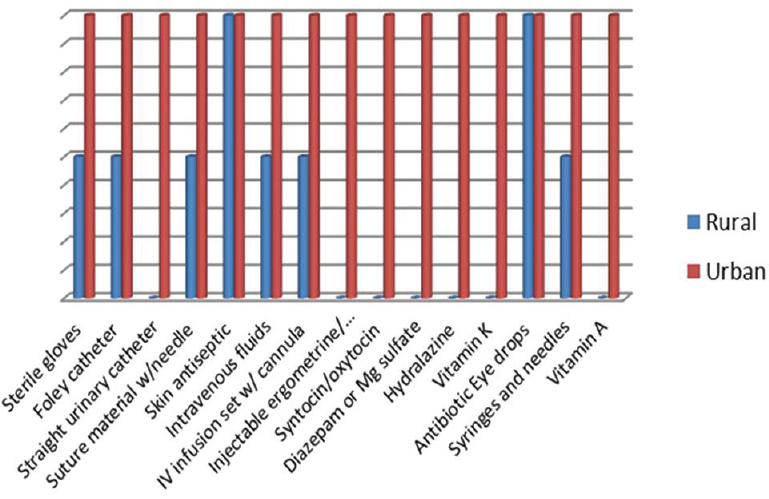 Moreover, there were multi-defects regarding minimal needed equipment to provide safe delivery services in rural health facilities, with incomplete supplies in urban facilities [Figure 3] and [Figure 4]. 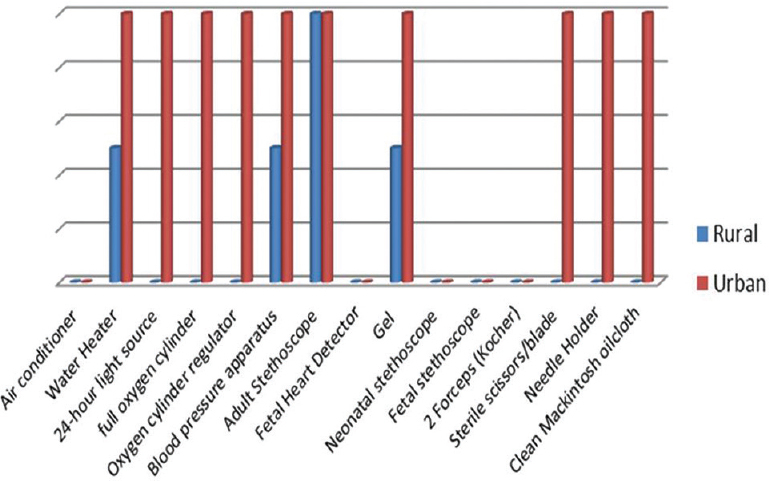 Another is absence of ultrasound set and infant scale and stethoscope in rural facilities which considered defects in equipment needed to provide antenatal care, with availability of almost all equipment in urban facilities [Figure 5]. Figure 3: Comparison between rural and urban health facilities regarding availability of equipment needed for delivery services. Figure 4: Comparison between rural and urban health facilities regarding other equipment needed for delivery services. 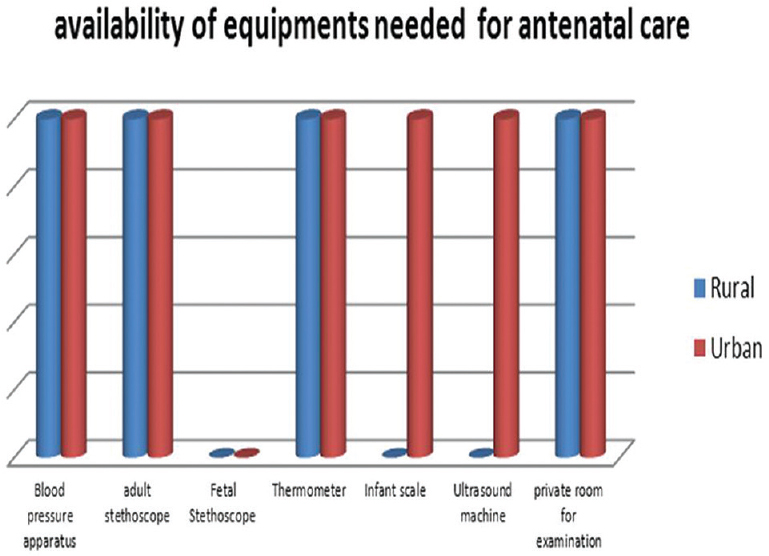 Figure 5: Comparison between rural and urban health facilities regarding available equipment needed for antenatal care. A great defect in recording and referral system in rural health facilities is the absence of transportation in emergencies in rural residence [Figure 6]. 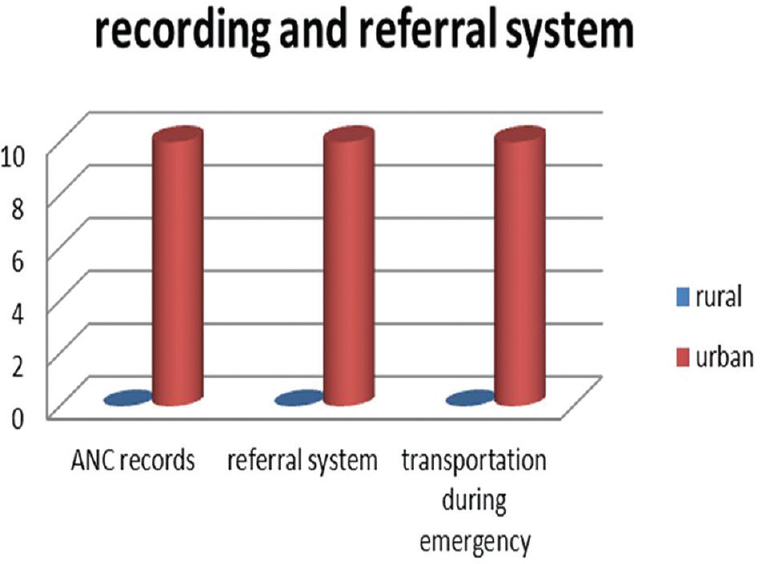 Figure 6: Comparison between rural and urban health facilities regarding recording and referral. ANC, antenatal clinic. The study showed high utilization rate with statistical significance of most of antenatal services provided by health facility in urban residences than the rural ones [Table 1]. It also showed availability and high utilization with statistical significance of natal (delivery) services in urban areas than in rural ones [Table 2]. The study showed great discrimination regarding resource allocation in the availability of rural and urban health facilities and readiness to provide antenatal/natal health services and supplies needed for them. As shown by graphical presentation of resource allocation checklist natal services are not provided in rural health facilities. The study showed absence of blood group and Rh factor typing in rural health facilities with availability of all routine laboratory investigations in urban facilities. This is considered as a defect in providing antenatal routine services according to the Ministry of Health recommendations . Moreover regarding equipment and supplies needed for antenatal and natal services great disparities were revealed regarding high discrimination of urban facilities over rural ones with high supplies and readiness of urban facilities to provide the services. A study carried out in China by Chen et al. agreed with the result and revealed that there was a gap between rural and urban areas and the gap between them has continued to grow although the total health expenditure in China has increased; this is because maldistribution of health resources to urban areas is much more than in rural ones resulting in limited availability and accessibility to healthcare services in rural areas. In contrast, a study done in Ghana by Kaba et al. , which revealed that healthcare resources are relatively better in rural areas than in urban areas as expressed by the extra salary given to doctors to motivate them to stay in rural areas with increasing health expenditure and equipment to rural health centers and clinics. The study has shown high defects in the referral system in rural health facilities with absence of transportation in emergencies in both rural and urban residences [Figure 6]. A study conducted in Zimbabwe by Munjanja et al. revealed that poor obstetric emergencies transportation is a major determinant of maternal and perinatal mortality and morbidity. This is mainly a problem of rural areas in low-income countries; also an organized referral system is mandatory for decreasing perinatal mortality and morbidity. World Health Organization Monitoring Emergency Obstetric Care Handbook  revealed the high effect of structuring a well-organized referral system with availability of a method for transportation in emergencies on decreasing obstetric complications. Regarding using antenatal health services there was high significance in relation to residence, it is clear that there is high rate of utilization of full antenatal services in urban residence (69%) than in rural ones (7.8%) and this result is compatible with what reported in Elzanaty  that urban mothers are somewhat more likely to receive antenatal care, especially regular care, than rural mothers. Another study was carried out in Shanghai by Zhoa et al. proved that residence had great effect on antenatal service utilization. The same result was reported in a study of two cohorts of pregnant women in Vietnam by Toan et al. .
Tetanus toxoid coverage had highly convergent results in rural and urban residences, 97.9 and 100%. respectively. This result agreed with that of Elzanaty , which revealed that tetanus toxoid coverage is widespread among mothers in Egypt, also agreed with the study of Vietnam carried out by Toan et al. . Another study carried out by Duru et al. among women in their reproductive age in South-East Nigeria revealed the same result; so there is low significance between tetanus toxoid coverage and residence. The present study showed that there is no statistical significance between having adequate antenatal follow-up visits and residence; only 45.5% of studied women from rural residence received adequate number of antenatal follow-up visits (≥4 visits). On the other hand, 67.6% of the studied women in urban residence had adequate regular antenatal visits. This result agreed with the study conducted by Abosse et al. in Hadyia zone Ethiopia regarding factors influencing antenatal care utilization. On the contrary, a study done by Agus et al. about factors influencing the use of antenatal care in rural West Sumatra, Indonesia, reveals that high percent of having adequate regular antenatal follow-up visits by women live in rural residence over those live in urban areas and referred this to the low socioeconomic standard of rural women and their need to low-cost health services. The study showed high utilization rate of delivery (natal) services in urban facilities, with unavailability and nonutilization of natal services in rural health facilities there is high percent of choosing home delivery under skilled person observation in urban areas (87.6%) more than in rural areas (41.8%) with availability of delivery services at night for obstetric emergencies in urban residence and, on contrary, unavailability of this service in rural residence. A study done by Naasegnibe et al. in Ghana which agreed with this result. revealing that residence is one of the determinants of natal service utilization with high percent of utilization in urban areas more than rural ones. The same result agreed with a study conducted in India by Roy et al. , which studied the determinants of Utilization of Antenatal Care Services in Rural Lucknow, India. On the contrary, a study carried out by Adogu et al. in Nigeria showed that women in rural area had high utilization rate for delivery services more than urban women and referred this to higher fertility rate of rural women than urban women; moreover the low socioeconomic standard of rural women encouraged them to prefer low-cost public services as against urban women who prefer private sector. There was maldistribution of health resources in rural and urban health facilities. With limited resources (equipments) needed to provide natal services, with incomplete routine laboratory investigations for antenatal care in rural health facilities because of limited resources. This disparity in resource allocation resulted in high utilization rate of antenatal and natal health services in urban primary health units rather than rural ones. Changing health policies is mandatory with increasing health expenditure for the sake of rural residence. Resource allocation redistribution according to needs, with equal quality of health services provided regardless of any residence or socioeconomic variations. Cuyler AJ. Equity – some theory and its policy implications. J Med Ethics 2001; 27:275–283. Oliver A, Mossialos E. Equity of access to health care: outlining the foundation for action. J Epidemiol Community Health 2004; 58:655–658. Dawood MM, Bin-Berik AS, Sayad A, Bawazir AA. Utilisation of reproductive health services by women in Mukalla City, Yemen. J Public Health Dev Ctries1 2015; 1:22–30. Farahat TM, Shaheen HM, Mohamed HM, Mahmoud Mohaseb MM. Knowledge and attitude of students in Menoufia University, Shebin Elkom city toward premarital care. Menoufia Med J 2014; 27:347–352. Elzanaty F, Alhassan KR. Egypt Demographic and Health Survey, 2014. Available from: https://dhsprogram.com/pubs/pdf/PR54/PR54.pdf. [Last accessed on 2015 Nov]. Haynes R. Geographical access to health care. Access to Health Care. Gulliford M, Morgan M, editors. London, UK: Routeledge; 2003;1239–1246. Ministry of Health and population, Information system: 2013. Available from: www.mohp.gov.eg/. [Last accessed on 2015 May]. Ministry of health and population: Egyptian health care accreditation organization, primary health care units and centers standards, certificate of accreditation ISQua, 2007. Available from: www.mohp.gov.eg/. Chen Y, Yin Z, Xie Q. Suggestions to ameliorate the inequity in urban/rural allocation of healthcare resources in China. Int J Equity Health 2014; 13:34. Alhassan RK, Nketiah-Amponsah E, Fenenga C, Duku S, Spieker N, et al. Rural-urban differences in health worker motivation and quality care in selected health facilities in Ghana, 2013. Available from: https://pdfs.semanticscholar.org/70c4/4f4c62c4c81e71647fcc007809ebe1b3139b.pdf. Munjanja SP, Magure T, Kandawasvika G. Geographical Access, Transport and Referral Systems, University of Zimbabwe, Harare, Zimbabwe, 2012. Available from: http://www.transaid.org/wp-content/uploads/2015/06/Geographical-AccessTransport-and-Referral-Systems.pdf. [Last accessed on 2016 July]. WHO, UNFPA, UNICEF and AMDD. Monitoring emergency obstetric care: a handbook. Geneva, Switzerland: WHO; 2009. Zhao Q, Huang ZJ, Yang S, Pan J, Smith B, Xu B. The utilization of antenatal care among rural-to-urban migrant women in Shanghai: a hospital-based cross-sectional study. BMC Public Health 2012; 12:1012. Tran TK, Nguyen CTK, Nguyen HD, Eriksson B, Bondjers G, Gottval Kl, et al. Urban – rural disparities in antenatal care utilization: a study of two cohorts of pregnant women in Vietnam. BMC Health Serv Res 2011; 11:120. Duru CB, Eke NO, Ifeadike CO, Diwe KC, Uwakwe KA, Nwosu HN BO, Chineke HN. Antenatal care services utilization among women of reproductive age in urban and rural communities of South East Nigeria a comparative study. Afrimedic J 2014; 5:50–58. Abosse Z, Woldie M, Ololo S. Factors influencing antenatal care service utilization in hadiya zone. Ethiop J Health Sci 2010; 20:75–82. Agus Y, Horiuchi S. Factors influencing the use of antenatal care in rural West Sumatra, Indonesia inclusive and trusted. BMC Pregnancy Childbirth 2012; 12:9. Kuunibe N, Nkegbe PK, Mumin YA. Department of Economics and Entrepreneurship Development Utilization of Reproductive Health Services in Ghana Developing Country Studies, The International Institute for Science, Technology and Education (IISTE). Available from: http://www.iiste.org, Developing Country Studies 2012; 2:104–109. Roy MP, Mohan U, Singh SK, Singh VK, Srivastava AK. Determinants of utilization of antenatal care services in rural Lucknow, India. J Family Med Prim Care 2013; 2:55–59. Adogu PO, Egenti BN, Ubajaka C, Onwasigwe C, Nnebue CC. Utilization of maternal health services in urban and rural communities of Anambra State, Nigeria. Niger J Med 2014; 23:61–69.